Staying with the theme of communication. Birds have completely different brains. Still, the smartest birds are more clever than most primates. And many parrots speak (although we have not learned their language yet). Parrot language studies have progressed enough to tell us that there is something huge going on. They apparently use names, as dolphins do. 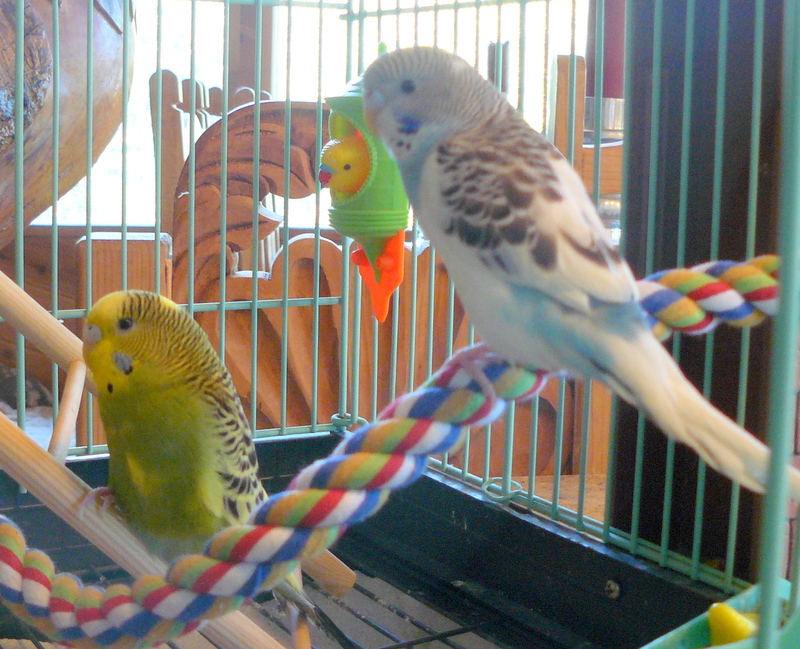 Certainly Jean would verify the amount of talking that goes on between our two budgerigars here at home! Mr. Green and Mr. Blu! Then in yesterday’s post The knowing of dogs, I referred to research that indicated that empathy between those that we know and trust, (a) can be measured, and (b) that “our minds are partly defined by their intersections with other minds.” I went on in that post to speculate that maybe dogs ‘reading’ the minds of humans that they know and trust wasn’t so far-fetched. Aug. 22, 2013 — When a member of the wolf pack leaves the group, the howling by those left behind isn’t a reflection of stress but of the quality of their relationships. So say researchers based on a study of nine wolves from two packs living at Austria’s Wolf Science Center that appears in Current Biology, a Cell Press publication, on August 22. For those that want to read the original research paper then it is available over at Current Biology, a Cell Press publication. While considerable research has addressed the function of animal vocalizations, the proximate mechanisms driving call production remain surprisingly unclear. Vocalizations may be driven by emotions and the physiological state evoked by changes in the social-ecological environment [1,2], or animals may have more control over their vocalizations, using them in flexible ways mediated by the animal’s understanding of its surrounding social world [3,4]. While both explanations are plausible and neither excludes the other, to date no study has attempted to experimentally investigate the influence of both emotional and cognitive factors on animal vocal usage. We aimed to disentangle the relative contribution of both mechanisms by examining howling in captive wolves. Using a separation experiment and by measuring cortisol levels, we specifically investigated whether howling is a physiological stress response to group fragmentation  and whether it is driven by social factors, particularly relationship quality [6,7]. Results showed that relationship quality between the howler and the leaving individual better predicted howling than did the current physiological state. Our findings shed important light on the degree to which animal vocal production can be considered as voluntary. So, don’t know about you, but it all seems to be suggesting how little we know about how animals communicate with the world around them. The Denial of Science: A review. A review of the recently published book by Martin Lack. In many ways it would be terribly easy to find fault with this book. If it had been written as a book, been through the edits that a new book requires, then published, those faults would be a significant criticism. This book is based on research originally undertaken – and a dissertation written – as part of my MA in Environmental Politics from Keele University in Staffordshire (in 2010-2011). Academics generally disapprove of the publication of academic research via non-academic, non-peer-reviewed routes. However, I am trying to reach more than just an academic audience. To a person unaccustomed to reading academic research, as is this reader, the structural and presentational differences between a ‘normal’ non-fiction book and a dissertation are significant. That needs to be borne in mind as you turn to page one. OK, now that I have got that off my chest, on to the substance of the review. That alone justifies the work that Martin put into his research and dissertation and his subsequent decision to adapt his findings into a book. There is not much time left to leave a sustainable world for future generations. Come on politicians and power-brokers; start acting as though you truly understand the urgency of the situation! Ah, that feels much better! Martin examines 5 categories that display denial behaviours, to a greater or lesser extent. These categories are: Organisations; Scientists, Economists, Journalists and Politicians. Oh, and a 6th catch-all category: Others. Each section dealing with a category is structured in the same way: Preliminary Research; Key Findings and Summary. Tables are used extensively to allow easy review of the findings. Again, what needs to be hammered out is that this format is very unlike a typical non-fiction book. Because it’s fundamentally an academic dissertation! But, so what! What is important is for the widest possible audience to understand the breadth and extent of the denial going on. Denial that is, literally, playing with the future of humanity on this planet; the only home we have. Furthermore, there is strong circumstantial evidence to suggest that this scepticism is being fuelled by those with a vested interest in the continuance of “business as usual” by seeking to downplay, deny or dismiss the scientific consensus on the extent of ACD. Martin Lack’s book may be unconventional in many ways. But as a tool to show how those who deny the science of climate change deny the right of future millions to live in a sustainable manner, it is most powerful. It is a valuable reference book that should be in every library and every secondary school across the globe! To add weight to the points made in this review, do look in on tomorrow’s post. I have no commercial links to Martin Lack; indeed, I purchased the copy of the book that I used for this review.